I teach music technology to high schoolers. I do some other stuff too. @willkuhn on Twitter. I’m excited to share a long-burning project of mine that I’ve recently completed. 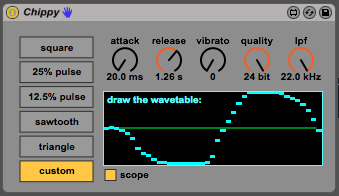 Chippy is a chiptune synthesizer, written as a Max for Live device. It has lots of cool features. I’ll probably add some features along the way, but for now this is what I will be using in my class for the chiptune assignment. I’ve posted the device on maxforlive.com for all to enjoy. Readers will recognize this as an extended version of the device built in the Chiptune chapter of Interactive Composition. At one point in the chapter I actively decide not to go the path of writing the polyphonic version of Chippy – polyphony in Max is not a task for beginners or most intermediate users of Ableton or Max for Live. Describing the process would almost warrant its own chapter, so I decided to skip it. Enjoy Chippy, and I appreciate any feedback you might have! I had a great time visiting sunny San Antonio last week in the dead of winter (read: 70 degrees). This year I was fortunate enough not only to give two workshops, but also to speak on behalf of the organization as the recipient of this year’s teacher of the year award. I am humbled and honored to receive the Mike Kovins TI:ME Teacher of the Year award. TI:ME is an organization I respect greatly and I am sincerely grateful for this recognition. I truly have no words. And now for some words. For those who don’t know me very well, here is my story. It’s a bit unconventional, but I imagine many in this room have taken a path unlike our peers in the music education world. At one point I aspired to be a great band director. In fact, my interest in music technology began in part by writing marching band arrangements. When I actually started teaching, however, I realized this way of life wasn’t for me. I became disillusioned at the fact that no matter what I did with my band, it had probably been done before. In that world, you can have success, you can have fun, you can build a program, you can make a living…but I didn’t feel like I could do anything truly new. I’m not a follower – it’s very difficult for me to do something that has already been done better by someone else. Realizing this I made plans to leave the teaching profession shortly after I had gotten started. In 2006, everything changed. I received a phone call that through some strange turn of events I would be teaching a class that had been fortuitously titled Music Technology at the High School. When I say titled, instead of planned you should know – that was all the planning – no meetings had taken place, no equipment had been purchased – there was only a class title and a room. All it took was that title. What they didn’t know was that since high school I lived and breathed electronic music in my spare time. I spent years absorbing the music of Aphex Twin, the Prodigy, DJ Shadow, and early Daft Punk. It wasn’t possible to buy equipment yet, but I devoured all the music I could – teaching a class on the topic of electronic music was like a dream come true. So on the first day of Music Tech class, what I found surprised me. I had three classes of seniors who needed my class to graduate – they were the type of people who waited three and a half years to get their fine arts credit. How do you teach music to kids like this, and make them enjoy it? So there is the secret to my success – at the very core of all my curriculum decisions is the memory of a room full of eighteen and possibly nineteen year olds staring at a recently transferred elementary teacher wondering what in the world the class could possibly offer to them. It turned out great because it simply had to be. I won’t go on with specifics about my classes – I have a session on that Saturday. Suffice to say this core belief has enabled my program to grow to a full course load that trains over 350 students per year to be creative with music using the latest tools available. I’ll use this opportunity to address those in the room – TI:ME – people I see as the chief innovators of music education. Keep using your work to spread the idea that music learning is a personal endeavor. Never be tempted to compete with each other, or compare to each other – everyone’s method can and should be different. The freedom to experiment with teaching methods and curriculum is what makes the arts the last bastion of individuality and culture in your school – don’t forget that, and don’t let it go. Let your instincts and your interests guide what you do, not what someone else says will get you recognition or a high rating. I’d like to thank Barbara Freedman for her tireless work in nominating me for this award. She’s been a great mentor and friend over the years, and I’m proud to share this honor with someone as successful and influential as she. I’d like to thank VJ Manzo, the smartest man alive, for also nominating me but also for approaching me to work on our new book, Interactive Composition. For a guy like that to take a chance on a slob like me means the world, and I hope you have as great a time working with me as I do with you. And finally I’d like to thank my children Annelise and Ethan, who told me I wasn’t allowed to go on this trip and who I miss very much right now, and especially my wife Jennifer. There’s not a thing I’ve done that she hasn’t been there to see me through – I wouldn’t be anywhere at all without her support and her guidance. I’ll do my best to live up to the expectations that come with receiving this award. Thank you! Part of what I do is produce awesome videos for our school and the community. This time, I’m doing a music video for my daughter’s Girl Scout troop – a parody of Shake it Off but about cookies. Without going into tons of detail about the entire process, I want to call attention to a technique I’ve read and watched a lot about but hadn’t gotten a chance to try until now – using slow motion footage for a music video. So here’s the idea: a normal video is shot at 24 or 30 frames per second, and played back at the same speed. Slow motion video is shot at 60 or more frames per second, and played back at 24 or 30 frames per second. If something’s happening at regular speed and shot in a high frame rate, it will look slow when you play it back. Thus, If something happens at a faster than normal speed and shot in a high frame rate, it will look normal-ish when you play it back. Audio is usually played back at regular speed for a video shoot, and the singer will just sing along with the track to keep it in sync. We then throw away the audio from the shoot, and use the perfectly synced motions of the singer in our video. In this case, we’re making the singer lip sync quickly to the song and slow down the footage later to allow this rapid motion to play back at regular speed with the song. Why do this? Because it looks awesome! It takes away the awkwardness of the singer just staring at you singing and really sells the action. It makes the whole thing feel a big bigger than life. To do this, I took the song that was to be used for lip-syncing, and made a 160% speed version using Ableton Live. My camera, the Canon XA25, converts 60fps footage to 24fps. Knowing these facts, it will take me speeding up the resultant video to 150% in Final Cut Pro to get something that lip-syncs with the “correct” original song. I’ll update this post with the full video when it’s finished. Expect cookie-themed costumes. I had an amazing time speaking at the Cincinnati Symphony Educator workshop the other day. The event was well-planned and hosted in the exquisite Corbett Tower, and the coordinator Logan Kelly was very helpful and great in leading the discussion afterwards. Check out their other events – it’s a very cool program. It’s a long watch, but it’s the best video I have right now of this session. Enjoy, and of course feel free to skip around. Around Christmas 2013 I was starting to worry about GarageBand. Since 2006 I had started my beginners on the software, which arguably ignited the entire movement of “older beginner” music composition courses. 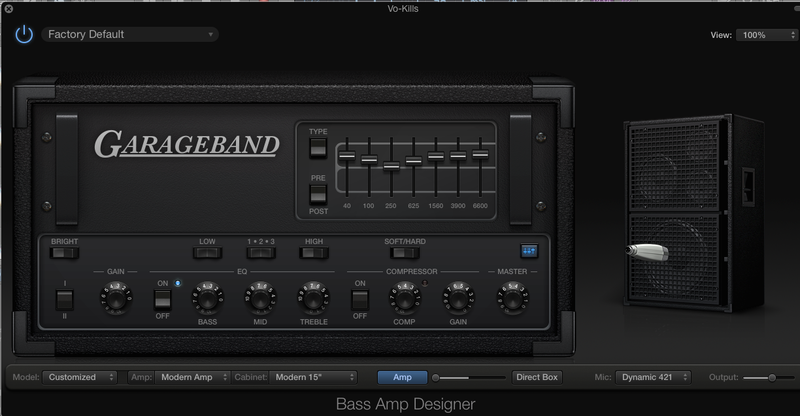 2013’s GarageBand 10, however, made me question the direction the software was taking. I would have to rework many of my lessons to work in the new version. Since I was already using Ableton Live in my advanced course, I decided it might make more sense to have my beginners use that software instead. Really there were no big negatives with the switch, other than a slight intangible fun factor that was not present in the first few weeks. Once we were off into my projects like the Radio Ad and sampling drum sounds from around the school they class felt exactly right, but there was a bit of magic missing from the first weeks. After another semester, I determined it was due to the weak loop selection in Live compared to GarageBand. 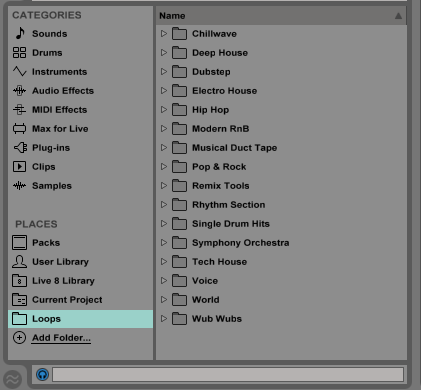 Ableton loops are not for the faint of heart – many of the “Clips” are exclusive to a specific device or sample pack and do not gracefully drag anywhere as audio files do. 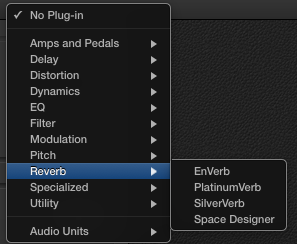 In addition, filenames are inconsistently named, so the search feature is not that helpful for the built-in loops, and there is no fancy metadata based filter system like there is in Logic or GarageBand. There had to be a way to use those gigs and gigs of Apple Loops sitting on my hard drive already to solve this problem. Here’s my step-by-step process to get Apple Loops usable in Live. 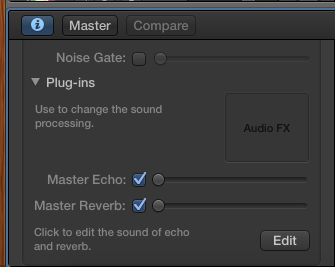 Using Audacity’s chains, open a folder .caf files and trim 56 milliseconds from the end, and save as .wav. I’m not sure if this is the exact amount of silence, but it resulted in a pretty usable loop. Using Keyfinder or similar software, load remaining loops from the “cleaned” folder. Have the software analyze and then write the key into the filenames. If you’re super picky, use the Apple Loops utility to verify that the keys from Keyfinder are correct. I had to correct a bunch of them, and I also manually tagged ones with black key names to include both names (i.e. Sweet-Guitar-Loop.A#m.Gbm.wav). Keyfinder had a lot of trouble with the newer “Layers” loops especially – lots of unclear pitches and 7th chords in there). Importantly, group any subfolders of loops into one big “Loops” folder. Add this folder to Ableton Live’s Places in the Browser – I observed that Live’s performance drops significantly if the subfolders are added separately to the browser. Notice the key tags at the end of the filenames. I had to do that semi-manually. Put all your loops in one big folder for optimal performance. If you add all the subfolders to places, Live will spend a lot of time searching the disk instead of making sick beats. 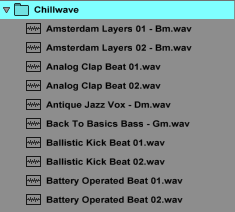 Now students have the entire GarageBand loop library (including the amazing Chillwave category), usably tagged and categorized, accessible in a much more loop friendly program. Since the beginning my music lab has had 25-key MIDI keyboards at each station. We started with the Korg K25’s and shortly after upgraded to the M-Audio Axiom 25’s we’ve had since 2008. I’ve toyed around with the idea of adding an unconventional controller to my lab for years, but not a single device fit my needs entirely. In fact, I’ve purchased several of these as single units intending to use them for the lab, but never felt confident enough to deploy them. With Akai’s latest crop of hybrid APC devices, I found the perfect tool for my lab. 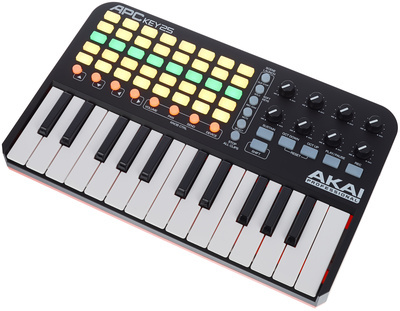 The APC Key 25 is small (we have limited desk space), includes 100% pre-programmed controls for clip launching and volume adjustment with zero setup, and includes 25 “good enough” keys. Since we don’t do piano technique as much as we just need a basic note input device, this board is the perfect complement to our Ableton-only curriculum. It even comes with Live Like Akai edition, which is not far off from Live Intro feature-wise. Our first week this semester felt magical again. It was like the old days when GarageBand was novel and people still thought the Secret Agent Guitar loop still sounded cool. Kids were able to create key-matched tracks and scenes with relative ease in a non-linear way using cutting edge tools and great sounds. Everyone used the keyboards, and it made life easier instead of harder! It was easy, fun and ultimately successful. Just because the tools don’t come perfect out of the box doesn’t mean you can’t bend them to your will. Setting up a great music tech class is about engineering the environment on the student workstations for optimal success, and that means sweating the details when it comes to things like searching the library or choosing which controller to buy. Good luck trying this on your own! Today, the National Core Arts Standards were updated, to much furor on the Music Teachers Facebook board. I feel like it is a good opportunity to discuss my feelings on the topic here. The Math teacher’s curriculum is required by law. The Music Teacher’s is not. Then, these “standards” must be a hedge against further inquiry into the appropriateness of including an optional Music curriculum in your school. Let’s pretend Music wasn’t a typical offering and you had to start a program from scratch. The standards could be considered a guideline for offerings. Since the Arts standards offer no guidance on pacing or content, it can be surmised that they are meant to be covered as a department rather than by each individual class. I believe this is not clearly defined to avoid confusion and difference in format from traditional core subject standards. To those worried about having to “teach to these standards”: I would be very interested in hearing of a story of a teacher having to significantly change their curriculum to match the standards. To those considering changing their curriculum – only do it if it benefits your students. For instance, reading about Mozart and writing a report is definitely not an age-appropriate activity for a first grade music course. These standards are not asking you to do that – but if you happen to do some reflective listening, there is a national justification for it. For those of you who do nothing but sing and dance at that age, there is also a national justification for that as well. Should every teacher attempt to address every standard? I don’t believe it’s possible, nor do I think that’s the intent of documents like these. In my view, the misconception is that these are designed for every music class to hit every standard. Yes, a band class can touch on reflective listening, but the bulk of activity in the course is designed for preparing live concerts. Likewise, my Music Technology classes can discuss and talk about performing our work, but the course is not designed around performances. Nor should it be, and nor is it being asked to be! As music teachers, we are terrified that a legislator that doesn’t “get it” will come in and make us give bubble tests in Choir and make our 6th grade non-performance general class give concerts. With proper justification for our activities this doesn’t have to be the case – and these standards are designed to be broad targets that pretty much every existing music program is already hitting. Why do they make new standards all the time? Simple. NAfME (and others) are lobbyists at the core. Their job is to ensure that Music & Arts are a part of mandatory education going forward. To that end, they release documents like the new Arts standards to show that they’re serious about playing ball in today’s educational landscape. Think STEM to STEAM. Without a standards document that matches the language and trends in education, there is no justification to add the “A” to STEM. The document is more about language and attitude than about practice for the average Music teacher. Your program will most likely fit into areas this document targets and the work you’re already doing with SLO’s will justify the performance of your students. If NAfME weren’t involved in this process and sat on the sidelines lamenting the decline of Music Education it wouldn’t do much good – by releasing standards and providing states with an easy-to-copy template they’re helping to keep Music & Art in the conversation. So what are the standards for then? They certainly don’t serve as a guide for anyone’s teaching. Music teachers have always taught to their personal strengths and will continue to do so regardless of what NAfME or anyone else says, barring standardized Music tests, which thankfully haven’t come into play. In my view, the standards are there for a teacher to have outside justification for what they do. Let’s say I want to teach Guitar instead of Band. With the standards, this is now possible. Let’s say I want to teach Music Technology instead of Music History. With the standards, this is now possible. Both cases require an amount of radical change to tradition, but fit well within current standards. There is no need to justify the worth of these activities, as they are within an agreed-upon set of standards. If the standards become too specific and constraining, there would be a big problem but in their current form (and knowing musicians, for the foreseeable future) they will retain enough room for big new, creative ideas. Not technically. They are, however, a template for states to use for their own standards process and will probably be copied down the road as states revise their standards. Again, Music standards are relative – there is no provision demanding that every 5th grader learn Violin, in the way that there are many mandates in state standards for students to achieve a certain degree of reading proficiency by a given age. So we call these “standards” to fit in with the current zeitgeist of education, but they are really guidelines – varying targets that a teacher can call out when justifying their lessons. Should teachers worry about the standards? Probably not. I suppose if you’re a bad teacher maybe. If we start requiring standardized tests for these subjects, then we can demand mandatory staffing for these subjects – again, we’re not there yet. But for now, these new arts standards will simply serve to be an external justification of what you already do.